Senmedeltida kopparutvinning i Åtvidaberg speglad i räkenskaper från 1500-talets början, utg. av Evert Melefors. Uppsala 2013. (Copper mining in Åtvidaberg reflected in Late medieval accounts). Samlingar utgivna av Svenska fornskriftsällskapet. Serie 1. Svenska skrifter 98. 143 pp. ISBN 978-91-979881-2-4. This is a commented edition of a series of Late medieval (1500- 1513?) accounts connected to copper mining in the parish of Åtvid, now the town of Åtvidaberg, Sweden, and its vicinities. Most of these accounts report deliveries of household wares from a central but undefined place in Åtvid to farmers, who partly seem to be engaged in copper production, and to seemingly professional copper miners as well. These accounts are kept in the National Archives of Sweden under five manuscripts sigla: C 45, 46, 47, 48 and 50, comprising altogether about 50 pages written by many different hands. The accounts can be traced back to a Johan Bese, a country nobleman, dead 1505, and his daughter Gunnild Johansdotter, married Bielke. Both are known for having been granted Åtvid as a fief by the two succsessive Sture regents. Their residence was Herrsäter in Värna parish near Åtvid. 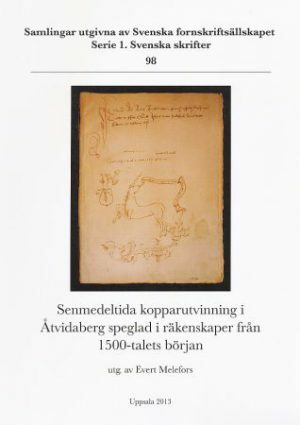 In the introductory part the connection between the accounts and the Bese family is discussed, starting with a paper document dated January 1, 1500, in which some wealthy business men and the future regent Svante Sture agree to initiate copper mining near Åtvidaberg. It is argued that this document can illuminate the accounts. In the main part of the edition all text of the accounts is transcribed and interpreted into Modern Swedish and the commodity for each person or client are commented upon, with focus on C 46 where also older transactions mentioned and crossed out in the other lists are put together and scrutinized. C 46 is shown to be a later summary of the other lists by its scribe and supposedly compiled for Gunnild Johansdotter after her return from Finland in 1513. In C 45, called “the old book” by the compilator and containing older private accounts for Johan Bese, there is a second part with the year 1510 at the top of a column, which indicates that the notes here are connected to Johan Beses heirs. In the accounts we meet people directly involved in copper mining and manufacturing through a great variety of reported transactions, where often copper measured by weight and produced at several local foundries is expected as payment for different imported wares like salt, hops and cloth but also dried fish, corn and meat, the latter consisting of many pairs of oxen, probably used for transport. Often we get collateral information about copper foundries and other localities, and we find here first mention of mines from medieval Sweden. Some notes even indicate that copper kettles and pans were manufactured for sale. In fact, these accounts are the very first written source of copper mining in Åtvidaberg some decades before the efforts of king Gustavus Wasa to exploit copper finds there again, and that in turn takes place more than two centuries before the copper industry of the 18th century. Key words: accounts, copper mining, Åtvid, foundries, medieval, 16th century.